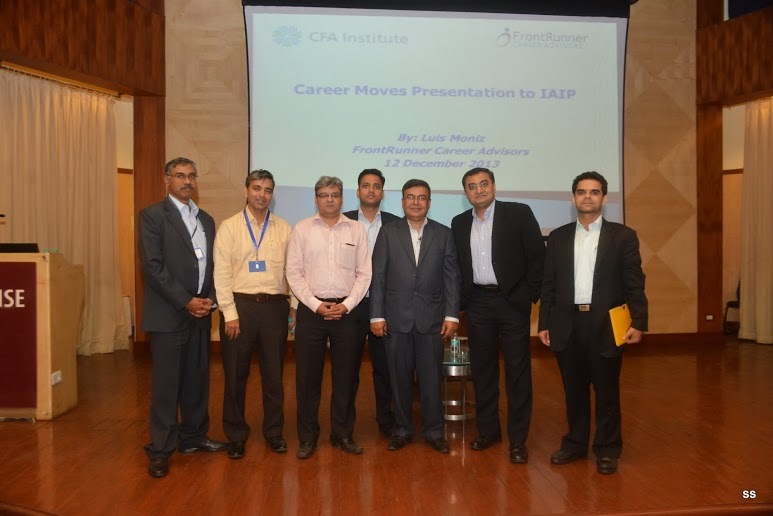 IAIP organised a Speaker Event titled “Career Moves” by Luis Moniz, Executive & Career Coach, FrontRunner Career Advisors in Mumbai on December 12th 2013. The event is reproduced below. Luis started the session by asking the audience members as to how many people in the audience considered themselves as Entrepreneurs. Only a few audience members raised their hands. Then the speaker replied by prompting that Everybody — irrespective of their profession or vocation— is inherently an Entrepreneur, since all are engaged in the Business of ‘adding value’ to the organization where they work. The value added is the net deliverable of every employee, which is the parameter on which all are judged. Next on his presentation were the issues critical to maintaining a harmonious and symbiotic relationship between organizations and their employees. He emphasized that, in order to survive and prosper in a difficult job market, employees must ‘create their own personal USP’, i.e. ‘no plain vanilla’ will be acceptable to any employer over any given period of time. Phase I: “Idealize”- Here the employee is convinced that his job is the greatest job in the world, one with the perfect Job Description. Phase II: “Honeymoon”- Here the mutual admiration between the employer and employee is at its peak. In the eyes of both parties, the other party can do no wrong. Phase III: “Ideal versus Reality”- In this phase, the first semblance of reality starts trickling in, signaling that the “honeymoon” is over and practical mundane matters must be attended to. Phase IV: “Peak Performance”- This phase is where employees attain and maintain peak productivity. The speaker termed this as “Energy-Magnetism Confluence”, which he would explain later. He stated that only a fortunate few attain and maintain this phase over extended periods of time. All great geniuses in history, like Mozart, Da Vinci and others are examples of this dominant phase. Phase V: “Plateau”- From here on, the ‘Magnetism’ component starts to dominate. The employee feels like he has achieved all he possibly can and there are no more challenges left to achieve. The heady exhilaration of Phase IV starts to wane, only to be replaced by a creeping feeling of stagnation. Phase VI: “Devaluation”- This is the most negative phase, marked by constant antipathy towards the job. Everything in office seems headed southwards, and everyone seems against the employee. The employee has no desire to go to work, as he/she feels constantly devalued at office. Push factors predominate in this phase, and conspire to end the employee’s association with his/her organization. Luis asked audience members to give a frank and honest assessment of which phase they were at in the above Job Life Cycle. Several members chimed in with their answers, which ranged from Phase II, III, IV and V and a few even stated they are in Phase VI, which drew peals of laughter from the assembled audience. great at or passionate about, relevant experience, etc. 6. Education: Include all degrees, certifications, technical skills, professional memberships arranged in reverse chronological order. 9. Personal Information: Include residential address, 2 to 3 passionate personal interests. Date of Birth details are fine in India, but illegal in some places like the US. No marital status or nationality details required. No passport details are necessary, unless you need a work permit. Luis stated that hiring is of two types- Growth Hiring and Churn Hiring. He elaborated that the former occurs during periods of rapid economic growth, while the latter occurs irrespective of the business cycle, due to employee layoffs and attrition. He went on to ask the audience as to which question is universally considered the trickiest to answer during an interview. Members of the audience replied that the most difficult question to answer is “Tell us something about yourself”! The speaker suggests spending a maximum of 5 minutes per event described, to keep it short and stay relevant. He also suggested creating a list of events in the STAR format described above. These events should ideally highlight the applicant’s skills in diverse areas related to business leadership and achievements. To sum up, Luis went through the highlights of the evening’s presentation and opened the discussion for questions. Audience members peppered the speaker with relevant questions pertaining to their fields of activity. The speaker fielded the questions and answered each with aplomb, bringing to bear his own experience in Investment Banking and Mentoring/Coaching. The event was concluded with a Vote of Thanks delivered by Jitendra Marchino, CFA who thanked the speaker for an enlightening presentation and also thanked the audience for their enthusiastic participation. This entry was posted in Career Event, Events, Mumbai and tagged CFA Institute, Frontrunner Career Advisors, IAIP, Indian Association of Investment Professionals, Ishwar Chidambaram CFA, Jitendra Marchino CFA, Luis Moniz. Bookmark the permalink.